I make this pineapple chutney or ananas ki chutney, whenever the I get a nice deal on pineapples. I invariably end up buying more that two at a time. After having the juice, eating as it is and as a salad, there is always one more left, with which I don't know what to do. So this recipe comes very handy. It is a easy chutney which is very good for digestion. Pineapple is a versatile fruit with the taste and flavor which is absolutely out of this world. Just the smell of a pineapple is enough to get your juices flowing in the mouth. But apart from the great taste, it also has got many nutritional and health benefits. Pineapple is a fruit with good nutritional value, including calcium, potassium and vitamin C. It is low in fat and cholesterol. It is also a good source of vitamin B1, vitamin B6, copper and dietary fiber. Pineapple has got digestive and natural anti-inflammatory properties. A group of sulfur-containing proteolytic enzymes in pineapple aid digestion. Fresh pineapples are rich in bromelain, which has anti-inflammatory effects, reducing swelling in inflammatory conditions such as acute sinusitis, sore throat, arthritis and gout, and speeding recovery from injuries and surgery. Pineapple or any other fruit is best eaten in between meals. So without much ado, here is the pineapple chutney recipe. Boil pineapple in the water, with turmeric, onion, salt and chili powder. When the pineapple becomes soft, add the grated coconut, cumin powder and sugar. Cook on high flame till all the water dries up. You can use a saucepan with a lid for this or even a pressure cooker (you will need just 1/2 cup of water in the pressure cooker). Ready to temper? Heat oil in a very small pan (the best is if you can get hold of a special tempering pan, it is very small round bottom pan, like a kadai, with a long handle). Add the mustard seeds and when they sputter and the rest of the ingredients mentioned under tempering. Stir for a minute or so. Make sure they don't get burned. Switch of the heat if need be. That's it mix all this in the chutney. Sneak a taste, you can always add more sugar, chili or salt. Enjoy the pineapple chutney along with your meal, or rice, or bread, with your sandwich or eat it as it is. 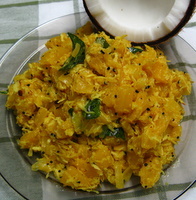 I like this recipe with visible pineapple pieces and crunchy grated coconut. It you want a smooth texture then you can puree the whole thing before tempering.